This article describes the ability to send and receive data using the nRF24L01 through the Java programming language from a PC. We have an Arduino Nano which has a USB port combined with an nRF24L01 on a circuit board. There will be more on this later but it is literally just two components with a cost of less than $5. We will call this the “Serial nRF24”. It attaches to the PC through a USB cable. To the PC, it then looks like a standard serial device with its own COM port. Data written to the COM port arrives at the Serial nRF24 while data written by the Serial nRF24 is available to be read from the COM port. Note that we have chosen CE to be pin 10 and CSN to be pin 9. The other pin selections are required. If you decide to use other pins, ensure you update the Arduino program to reflect your selection. 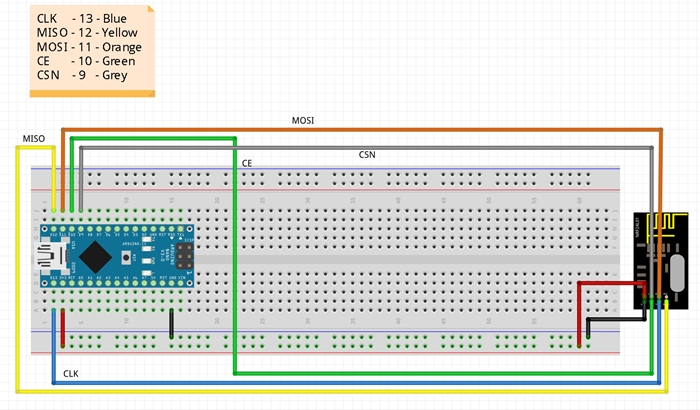 Running on the Serial nRF24 is a pre-written Arduino program (sketch) that is supplied with this article. There is nothing more to be said about this program other than you load it up one time. Finally, we have a Java JAR file that you make available on the PC. This JAR file contains a class called NRF24Serial which exposes APIs that can be called by your own Java apps that run on the PC. Your Java apps have no idea how the NRF24Serial class is implemented but, between you and me, the class reads and writes to the COM port which thus reads and writes to the Serial nRF24 which in turn interacts with other nRF24s wirelessly. Construct an instance of the class where the Serial nRF24 is found on the specified COM port. Construct an instance of the class using the pre-populated SerialPort object as the interface to Serial nRF24. Become a receiver and start listening for incoming packets of data. Stop being a receiver and allow us to transmit outgoing packets of data. Specify the target address of the device to which we wish to transmit data. Specify our address against which other devices can transmit data to us. Read data received over the network and place in the data array. Write data over the network to the partner device. Dump the details of the nRF24L01 device. Test that we have a connection to our own nRF24L01 device and that all is well. As we have seen, the Java API connects to the Serial nRF24 using USB, but what does the actual serial protocol look like? What if we want to drive the Serial nRF24 using a library other than Java? Here we delve into the protocol used by Serial nRF24. “OK” – The command executed correctly. “FAIL” – The command failed. Following the FAIL indicator is a text string providing more details of the failure. No parameters. Tests connection to the Serial nRF24. TX – Make the Serial nRF24 a transmitter of data. RX – Make the Serial nRF24 a receiver of data. Set the address that the Serial nRF24 will appear as to other transmitters. This is our identity on the network. Set the address that the Serial nRF24 will send data to on the next transmission. Set the channel used for communications. Transmit data. The length of the data is specified as a parameter. The actual data to be transmitted is sent immediately after the command. Read data. The length of the data to be read is specified as a parameter. The actual data read is returned immediately after the command. Dump the current state of the Serial nRF24 to the serial stream. This is used exclusively for debugging. Returns “OK” if we have detected a carrier and “FAIL” otherwise. Set the baud rate that the Serial nRF24 uses to communicate over serial. The default baud is 9600. This entry was posted in electronics and tagged nRF24 on 2015-06-27 by kolban.